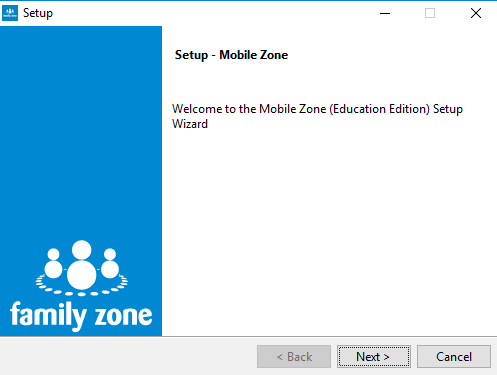 This tutorial will explain how to install the family zone application on student’s BYOD devices. N.B. Once student’s have the family zone application installed on their devices, you will need to contact IT via helpdesk@danebank.nsw.edu.au with the name of the student(s) that have had the family zone application installed so that we can pass the data onto Family Zone – otherwise that software will not do anything. 1. 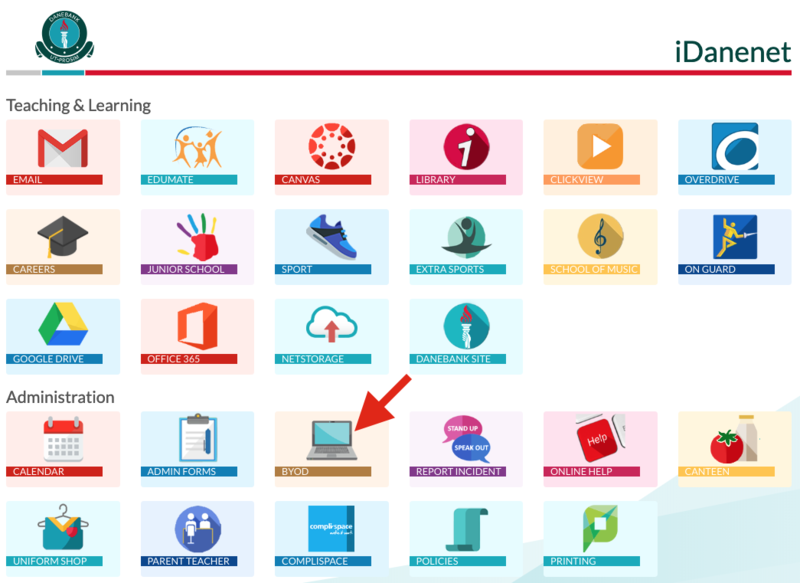 Go to iDanenet and click on ‘BYOD’. 2. 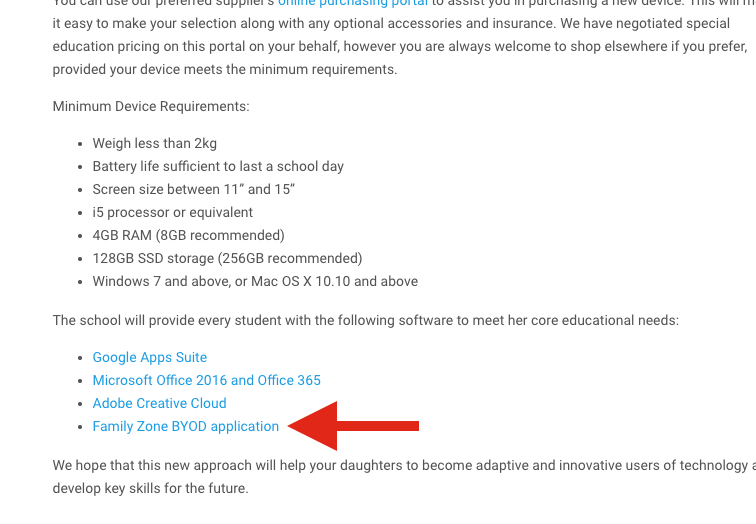 Scroll down and click on ‘Family Zone BYOD application’. 3. Scroll down on the family zone site, and click on the appropriate download link depending on what BYOD device you are installing on. 4. The download will appear a bit differently in different browsers. In either case, once the download is finished, double click the file name to begin installation. 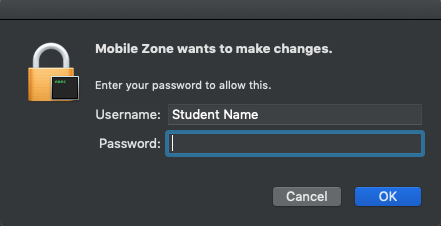 On a mac, you might be prompted for a password – this is the student’s password that they use to log into the laptop, not their school password! 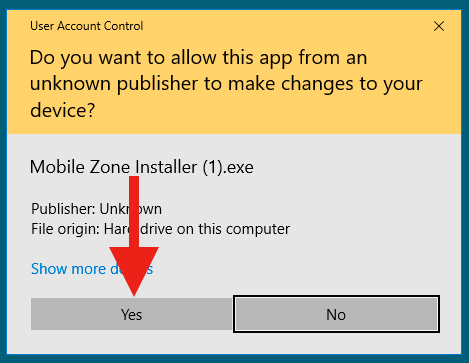 On Windows, you should just need to click ‘Yes’ on the dialogue box that opens up. N.B. If a student doesn’t have ‘administrator’ privileges on their BYOD device, they will only be able to install this software with their parents who will have the administrator passwords to be able to install software. 6. Follow the prompts to install the software on the student’s device. Once it is installed, contact IT via helpdesk@danebank.nsw.edu.au with the student’s name (or group of students) and mentioning that they have just had their family zone BYOD software installed and will need their data sent to Family Zone. 7. The student’s device will automatically be linked to their family’s account once family zone have that data, and no log into the application will be required – the parents simply need to have activated their family account. And then locating the student and clicking ‘resend invite’.